A video of policemen folding red and white garments and placing them in a bag during Saturday’s gilets jaunes (yellow vests) protests has been widely circulated on social media. On Twitter, a popular account accused the officers of stealing the Paris Saint Germain (PSG) jerseys after the club’s store in the Champs Elysees was looted during the protests. However, it remains unclear if what the policemen are folding are PSG jerseys and what they intended to do with them. The Paris police headquarters told Euronews that an investigation by the General Inspectorate of the National Police (IGPN) was opened on Saturday to determine what the policemen motives were. 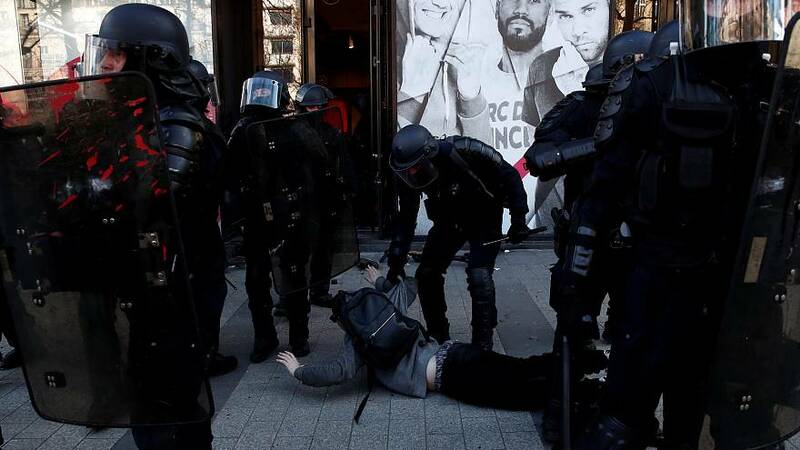 The images were taken by Brut journalist Remy Buisine during one his regular live streams of the gilets jaunes protests in Paris. #DIRECT - #GiletsJaunes - L’Acte 18 des gilets jaunes à Paris sous tension. Rémy Buisine en direct. The scene starts at 4h 54 minutes 55 seconds of the live where a policeman is seen picking up red t-shirts from the floor outside of the PSG store. Minutes later another police officer is seen folding white and black long sleeve shirts and putting them in a bag. There are other officers and protesters nearby but no one seems to mind that Buisine is filming the scene until he starts saying: “These are some of the garments that were..” and before he’s able to finish his sentence, the journalist's phone gets knocked out of his hands. Buisine is then heard accusing a policeman of trying to knock the phone out of his hand to which a policeman answers "all press are liars". The Paris police headquarters said they didn't know how long the investigation would last.